How many concours d'elegance car shows are there each year? How many concours d’elegance shows are there? Some car collectors are surprised to hear there are about 60 concours d’elegance events in the US. Our current master list contains about 70 shows, but some are in transition and others require confirmation for 2013. Our goal is to keep visitors informed about every concours with regular updates. There are many concours events, notices, updates, reports, photos, schedules, videos, and other details that still need to be uploaded to this site. Please understand that we’re pedalling as fast as we can. Most classic, vintage and antique car owners take it for granted that a concours d’elegance is an upscale automobile event, with maybe a class or two for motorcycles. Some shows have a special categories for other kinds of vehicles, such as boats, trucks, airplanes, and even pedal cars. However, there’s a whole realm of motorcycle only concours of which a few will be included here. 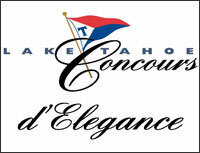 There’s also the Lake Tahoe Concours d’Elegance for boats only that’s been held annually since 1972. The beautiful wooden boats are shown where they belong. . . in the water! It’s such a classy display that we plan to include it with reports on the automotive concours.